This Modern Transitional Outdoor Living Space in Basking Ridge, NJ Offers Every Luxury in a Compact Design. As a Basking Ridge, NJ Deck Builder, each element of this project was carefully considered. Creating modern deck designs is our passion. Using Zuri premium decking in weathered gray gives this space the cool, weathered look without the maintenance. 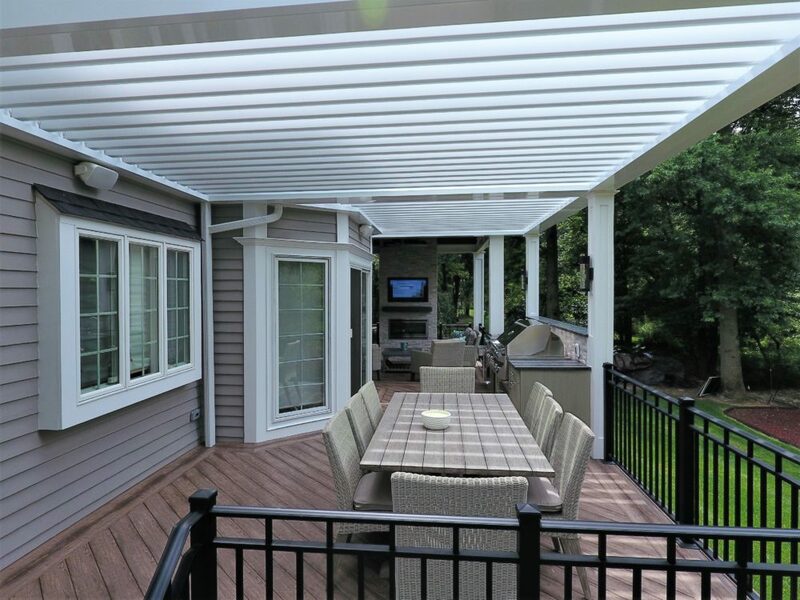 To complement the space, we designed the Equinox Louvered Roof, a modern outdoor deck cover, which can be opened fully to enjoy the sun and closed for a completely dry area. 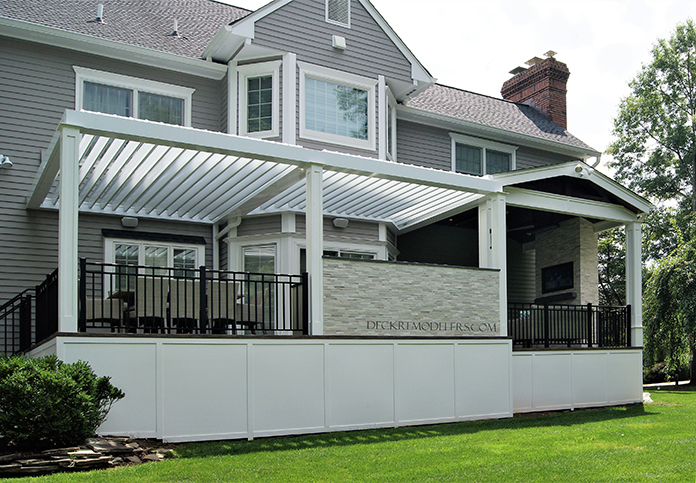 Available exclusively through Deck Remodelers, the louvered roof system has eliminated the challenges that weather can pose when planning outdoor events. It protects from the blazing sun as well as the rain, allowing for stress free entertaining. 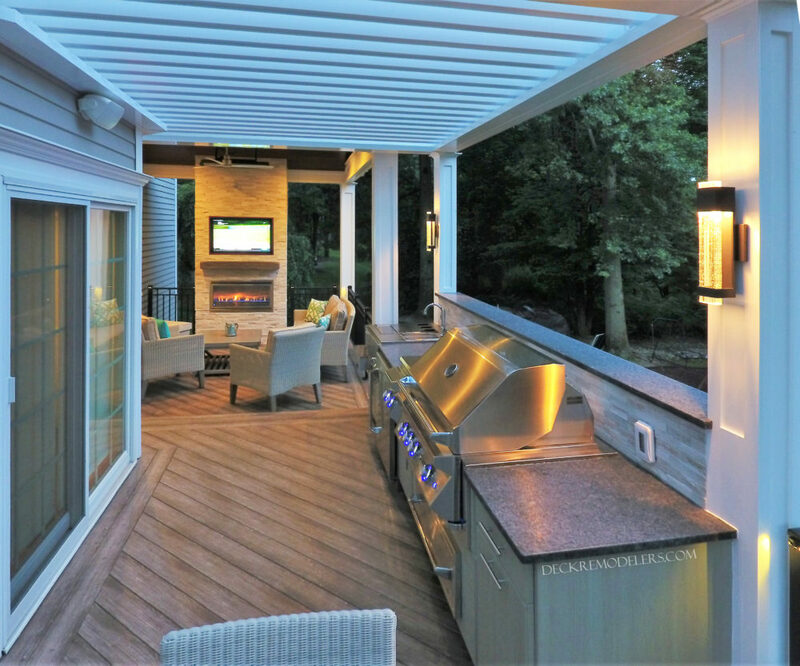 The modern outdoor kitchen, was designed by our award winning, in-house outdoor kitchen designer, who worked closely with our Basking Ridge homeowner. Chosen first, NatureKast Cabinetry, an amazing resin product with the look of real wood and strong enough to remain beautiful throughout the seasons. A Twin Eagles built-in grill, outdoor refrigerator, outdoor bar, and side burners were chosen for their high quality and durability. As outdoor appliance dealers, we not only have expert kitchen designers, our team of outdoor kitchen installers make sure every detail is tended to. A n understated mosaic stone wall and backsplash were incorporated to add texture and a modern architectural element and tie into the outdoor fireplace. The final touch was a leathered granite counter top, a new take on a traditional product. 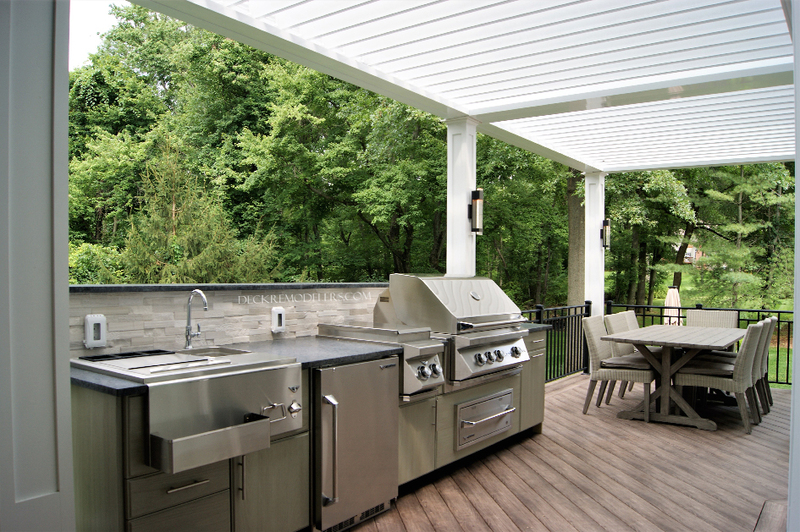 A more traditional, full roof was used to cover this portion of the deck to create a separate room feel. Warm, rich brown tones of the tigerwood ceilings adds the ‘indoor’ feel to this outdoor living room. Carrying on with the modern design was the outdoor fireplace with outdoor blower. Adding the gas fireplace, created a cozy area for friends and family to gather for warmth and ambiance, without the worry of burning wood. With the touch of a button, your outdoor gas fireplace is roaring and warm. A similar mosaic stone was used to match the stone used in the kitchen. 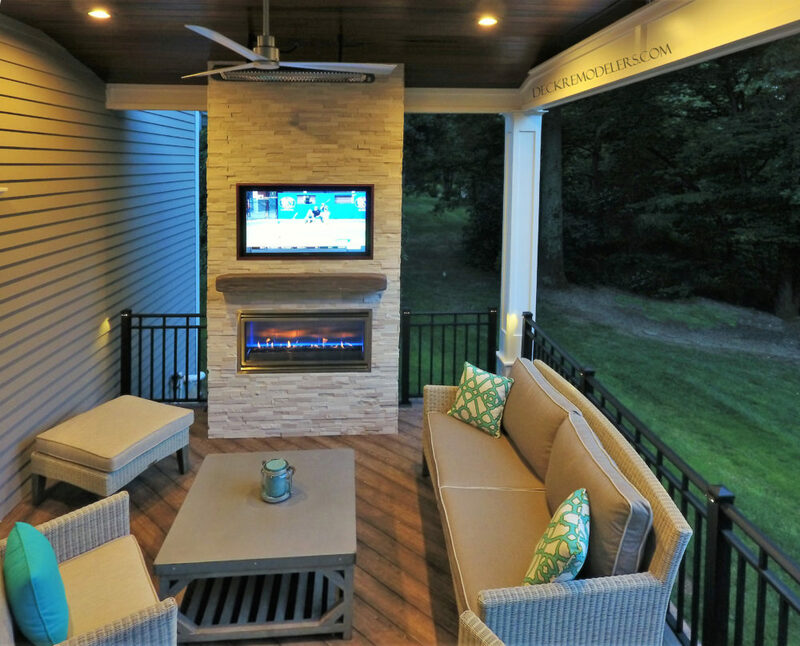 The outdoor TV place on the fireplace makes this space a perfect gathering place to watch the game. Carefully placed outdoor lighting transitions this space from night to day beautifully. 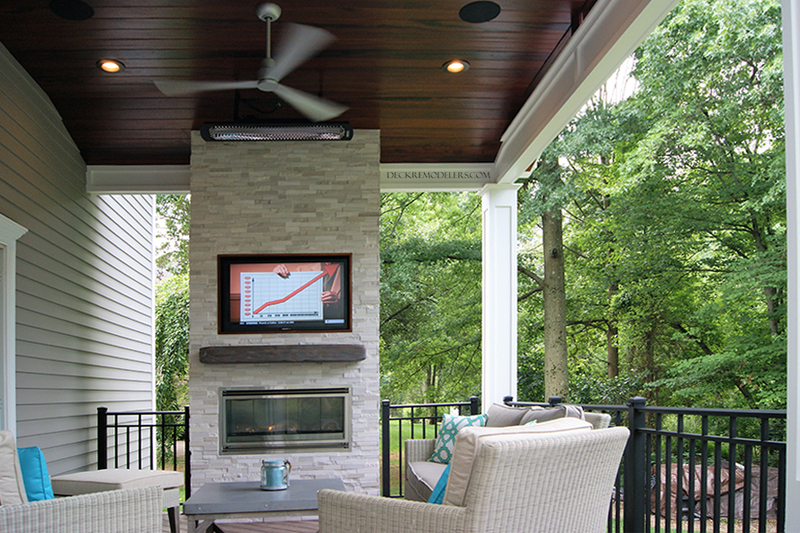 Outdoor heaters and outdoor ceiling fans allow this outdoor living space to be used from the hot summer days to the cool fall nights. 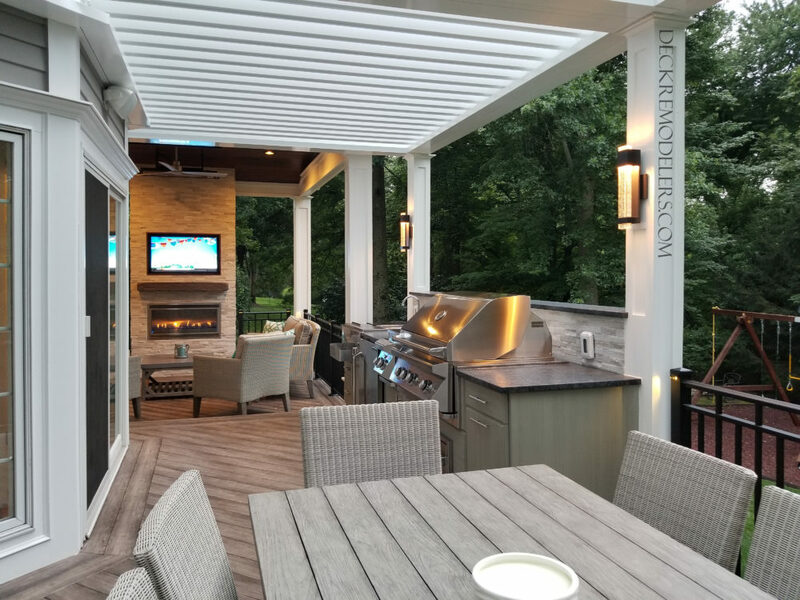 Deck Remodelers works throughout Somerset County, building decks in Warren, designing outdoor kitchens in Bernards Township and installing Equinox Louvered Roofs in Watchung. We are experienced with the codes of each town as well as permit procedures. 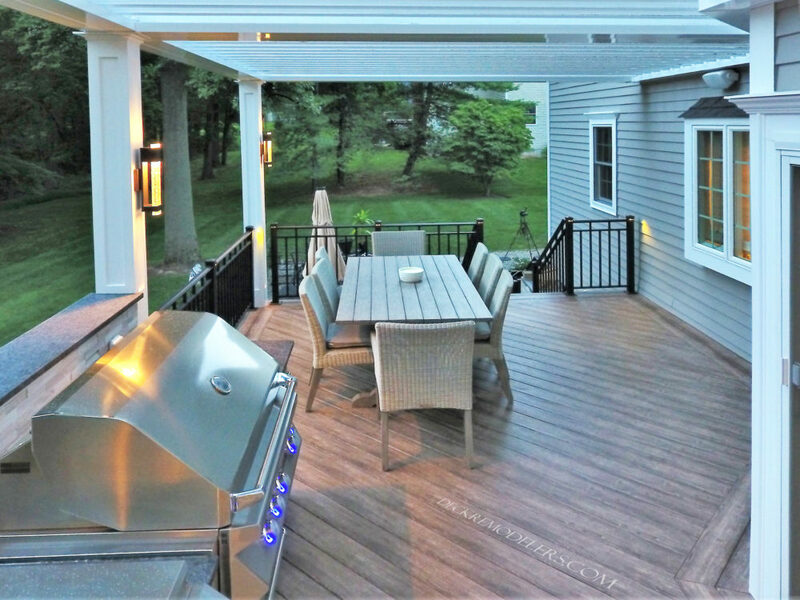 If you are looking for a modern transitional deck builder in Basking Ridge, call the experts at Deck Remodelers, for a premium experience and one of a kind outdoor living space.